The following was presented by Diane Drier, Vice President of the Gas Drilling Awareness Coalition, at the Earth Day Celebration in Wilkes-Barre, PA, on Monday April 22, 2013. Before the shale gas industry invaded Pennsylvania, most of us who now have serious concerns about shale gas extraction, had never written to our elected representatives, we had never written letters to the editor, and we had never taken part in rallies or protests. But now, people from all walks of life are galvanized to try to preserve our air and water from the negative environmental consequences of gas and oil extraction. 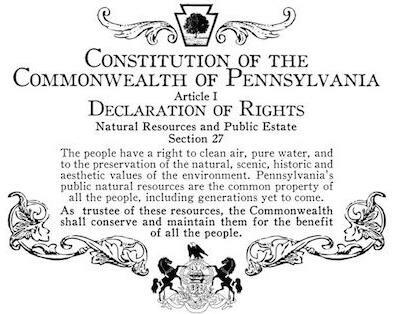 More than 20 years ago, Pennsylvania voters ratified a Constitutional Amendment that reads: The people have a right to clean air, pure water, and to the preservation of the natural, scenic, historic and aesthetic values of the environment. Pennsylvania’s public natural resources are the common property of all the people, including generations yet to come. As trustees of these resources the Commonwealth shall conserve and maintain them for the benefit of all the people. The problems with the DEP, even the casual observer would have to conclude, is that some of our elected and appointed officials, those who are responsible for protecting the rights delineated in this Constitutional Amendment, act as though they have never actually read this Constitutional Amendment. For instance, it has been reported that the DEP often takes a combative stance when presented with legitimate questions from concerned citizens and treats these concerned citizens as adversaries – and that when it comes to water near frack wells, the DEP is doing everything it can to put on blinders. It has also been reported that the DEP has used incomplete and misleading water test results to dismiss homeowner’s complaints and to protect the gas industry. We, the People, demand that the DEP adopt a consistent protocol for testing contaminants in residential water wells, based on scientific principles, – a protocol which tests for dangerous toxins associated with shale gas drilling. We, the People, demand that complete and transparent test results are provided to homeowners on a timely basis. As the Governor considers his choices for the next Secretary of the DEP, We, the People, demand: That the next Secretary of the DEP come from a background of science and not from a background of lawyering and lobbying. We, the People, demand: That the next Secretary of the DEP be free of any ties to the oil and gas industry. And We, the People, demand: That the next Secretary of the DEP agree not to work in the oil and gas industry for five years after he leaves office. We demand a Secretary of the DEP who will take seriously the core mission of that important agency. We, The People, demand that the Governor reopen the DEP Office of Energy and Technology Deployment to develop solar, wind and other renewable energy technologies right here in Pennsylvania. Nations, like Germany, are leading the way in renewable energy research and development. Twenty two percent of Germany’s power is generated with renewables with solar providing a fourth of that total. Through a combination of government policy and widespread public support, Germany, which is smaller than the state of Montana, has more installed solar capacity than the entire United States. And this in a country that has limited sunshine – Germany gets about the same amount of sunshine as the state of Alaska. Countries are not the only entities turning to renewable energy sources – many of our airlines report increasing progress in research using combinations of bio fuels and synthetic fuels to eventually replace petroleum products. The past belong to fossil fuels but the future belongs to renewable energy. We, the people, demand that the Governor and the DEP to look to the future towards clean, renewable energy sources instead of looking to the past in the extraction of dirty fossil fuels. The Constitution of our Commonwealth states that We, the People, have a right to clean air and pure water. We Demand that our elected and appointed officials protect the rights that are guaranteed to us in the Constitution of the Commonwealth of Pennsylvania and return the DEP to its core mission of protecting the environment for all Pennsylvanians – including generations yet to come. The Citizens Advisory Council to the Department of Environmental Protection is requesting ideas on how to improve public participation in developing environmental regulations and policies. The deadline for suggestions is April 26. This is an opportunity to contribute meaningfully to a DEP policy that will have a great impact on future public participation policies. It has been more than a decade since these policies have been updated. With the surge of shale gas development around the state, many residents have first-hand experience with public participation processes and may have suggestions that they can share with the Advisory Council. — The lack of a single calendar of upcoming advisory committee and subcommittee meetings and conference calls on the agency’s website. The Council invites you to submit comments by April 26, 2013 by sending email to: RA-epcontactcac@pa.gov. Please include your name, organization, if any, return mailing address, email and telephone number. Send in your comments and suggestions. This is YOUR opportunity to be heard. Tell the DEP to let the PEOPLE be heard. Tags: Article 1, Citizens Advisory Council, DEP, Department of Environmental Protection, earth day, environment, fracking, gas drilling, Natural Resources, PA Constitution, Pennsylvania, Public Estates, right to clean air, right to pure water, right to the preservation of our land, submit comments | Permalink.